MANILA, Philippines (CNS) — The Philippines’ newest cardinal was among 1,000 guests who witnessed the peace agreement between the government and the country’s largest Muslim rebel group. Cotabato Cardinal Orlando Quevedo’s archdiocese in the southern island of Mindanao includes the main administrative camp for the rebels of the Moro Islamic Liberation Front. A number of ranking members of the front attended Oblate-run Notre Dame University, where the cardinal served as president. They have noted his long-standing empathy and understanding of the plight of the Muslims. “These three things, which have been ours since time immemorial, unjustly taken through colonization and occupation, are now returned to us,” Murad said at the ceremony on the grounds of the presidential palace in Manila. The pact, which officials call the “Comprehensive Agreement on the Bangsamoro” creates a self-governing region in Mindanao. 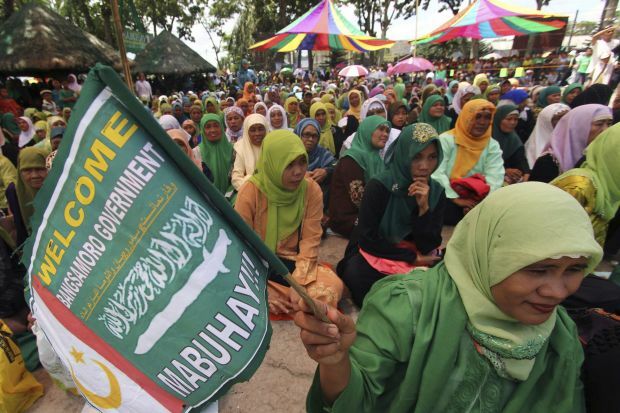 The region to be called Bangsamoro — a name coined by the rebels for all residents of Muslim-majority Mindanao, including Christians and indigenous peoples — will have a parliamentary form of government. It will be able to generate its own revenues, collect a significant portion of royalties from natural resources in the area and form its own law enforcement, among wide-ranging powers. The central government in Manila will maintain national defense, currency and postal services. “Let’s pray for the success of this peace agreement that promises lasting and just peace in our region of Mindanao,” said Cardinal Quevedo. In a statement, Archbishop Socrates Villegas, president of the Catholic Bishops’ Conference of the Philippines, said the conference rejoiced “with our countrymen” over the signing. He urged the implementers of the agreement to pay special attention to “those who feel marginalized,” including smaller rebel factions not happy with the deal, and he pushed for development in the affected region. “The promotion of total human development is long delayed. It cannot wait further. The people of Mindanao have been suffering for decades,” said Archbishop Villegas.